I have written before of my growing dissatisfaction over the genre-fication of literature but nothing riles me quite so much as when people can’t even be bothered to get their pesky labelling correct. Whatever it is, THE WEEPING GIRL is not, as the pull quote from The Guardian proclaims on the copy I read, “the best of Nordic Noir“. I know the phrase alliterates well but there’s really nothing noir-ish about this tale of the tragedy that results from a young girl changing her mind one day in 1983. Shortly after making this fateful decision Winnie Maas lies dead on a railway track and we don’t learn more about her until much later in the novel. Instead action moves to 1999 where DI Ewa Moreno of the Maardam police station is about to go on four weeks’ holiday. Before leaving though she is called into her boss’ office where he asks her to do a little bit of work on her holidays. A career criminal has been caught and is willing to dish the dirt on some of his associates in return for some favours, but he will only talk to Moreno. As he was caught near where Moreno is due to go on holidays it does not seem like a huge burden to interview him and so she agrees. And while it ultimately proves to be a highly distasteful experience for Moreno and her colleagues this thread does not form the main crux of the novel. On her train trip to Lejnice she meets a young girl who is on her way to the same town to meet her father, a man she hasn’t seen since she was two because ‘he did something bad’ and has been in psychiatric care ever since. A few days later Moreno is in the local police station when this girl’s mother arrives to report her daughter missing and Moreno can’t help but get involved, especially as the local police chief appears particularly incompetent. Having retired his popular Inspector Van Veeteren to life as a bookseller Nesser’s really allowed his protégé, Ewa Moreno, to take centre stage here (though her former boss does make a cameo appearance). She contrasts in almost every way with Van Veeteren – she’s female, in her 30’s and as yet is not married nor had any children – so there is little temptation to compare the two leads which allows her to shine in her own right. She does share Van Veeteren’s intelligence and dedication, fine traits in any procedural’s protagonist, though I must admit I missed the humour I associated with her former boss. There is still a strain of the wit here but it’s muted in comparison to the earlier books I’ve read. But the main feature of this novel is really the story which is deftly told, slowly revealing the enormity of the tragedy which had taken place 16 years earlier and the lasting ramifications it had – was still having – for all involved. The thing I loved, and admired, about the plot is that every time I thought I had figured out the next twist I turned out to be wrong as Nesser had been cleverer, and subtler, than I was giving him credit for. The ending is unexpected and I found it satisfying even with a certain moral ambiguity on display. Although it’s longer than my ideal book I found THE WEEPING GIRL quick to read and the sort of book I longed to get back to whenever I was forced to put it down. As it requires no knowledge of the earlier books in the series it is a novel I feel happy to recommend to all crime fiction fans, even if you’re not acquainted with Nesser’s most well-known character. This entry was posted in book review, Hakan Nesser. Bookmark the permalink. 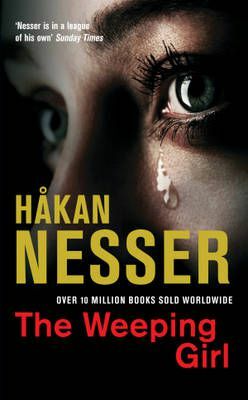 I have just finished my first Hakan Nesser and enjoyed it a lot. Found it the kind of book I wanted to keep reading, not put down, as you describe. I am glad to see that the series highlights other detectives as it moves along, not that I don’t like Inspector Van Veeteren. But I find using different detectives spices up series. Anyway, also agree with you on the label Nordic Noir. Either a book is noir or it isn’t. Wikipedia describes Nordic Noir as referring to “the literary genre of Scandinavian crime fiction.” Which is a lot too broad. Oh well. So glad to hear this is a good one and that it isn’t “noir” is fine with me, although proper labelling would have been better. Publishers probably think “noir” books are better sellers so that’s why they do this. A fan of Van Veeteren’s, I will read this mystery but, alas, I will miss the inspector’s terrific sense of humor which would sometimes take me by surprise, but I enjoyed it. Bernadette, Nesser is on my TBR pile, but not this one, which means I’ve probably got to get the wallet out again! I don’t understand the overuse of “noir” either. Do marketing departments slap the word on a book just because it’s not a cozy? I think this is another case where I don’t find jacket copy, blurbs, etc to be useful in the least. The last Nesser I read was The Hour of the Wolves, although my personal favourite is the Woman with the Birthmark. This looks like another good read. Thanks for the review Bernadette. p/s: You are right, I am not sure about the use of the sales tagline too.